They say the dream come true. However it shall not come true without doing anything. Also it shall not come true in a day. The dream become as the wish, you try effort to realize the wish as target. The effort is to concentrate on the target with all ability. Therefore only when the firm target, the strong will that never give up, and the daily effort become together, your future shall be bright. The target of our stuff is education to be an international person who are well educated and graceful. Support for establishment for your future is our mission. And your “dream come true” is also our all stuff’s “dream come true”. In our school we prepare the course guidance immediately after entrance, support well plan for preparation of examination. Furthermore, in accordance with individual situation, we guide how to write self-introduction letter to professor in the school to enter and make appointment for interview, translation of graduation essay to Japanese, how to write study planning and correction, measure for interview test, and so on. 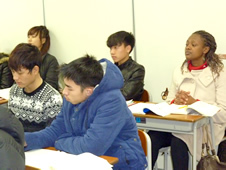 The class in our school provide curriculum for the study abroad examination. And through daily study reading understanding, hearing understanding sentence expression will be improved smoothly. Also, in application guidance and entrance examination guidance in the examination time (June, November). We give precise instruction about how to write application form and examination knowledge. In our school, Japanese ability examination N2, N1 in graduation year pas program is provide as study schedule. It will improve learning language knowledge, reading understanding and hearing understanding that are adjusted with their levels. Also, analyzing question pattern of new test, we instruct in daily class, so that examination measure goes smooth. Long experience teachers give instruction of measure for examination twice year (July, December), application guidance and just before examination guidance. Student abroad with good school record and good attendance is eligible to receive our school scholarship. ※Pay amount of scholarship of our school own is April 2017 base. This base shall change without advanced notice.